Hi all and welcome to another week on the Simon Says Stamp Wednesday Challenge. Thank you for joining us for the Use a Stamp Challenge and we hope you will all join us again this week too. This card is my take on the challenge. I started with sponging a white cardstock panel with some distress inks. I have used Abandoned Coral, Mustard Seed, Chipped Sapphire and Dried Marigold. I made sure they blended well. Then used Hey, Hi Hello die set to die cut the speech bubbles out. I wondered for a bit whether to keep the words inside the speech bubbles or take it out or swapp. In the end, I decided to keep them as it is. I adhered these speech bubbles randomly on a white card panel. Trimmed this panel to size. The lower panel is sponged with Mustard Seed and Dried Marigold. 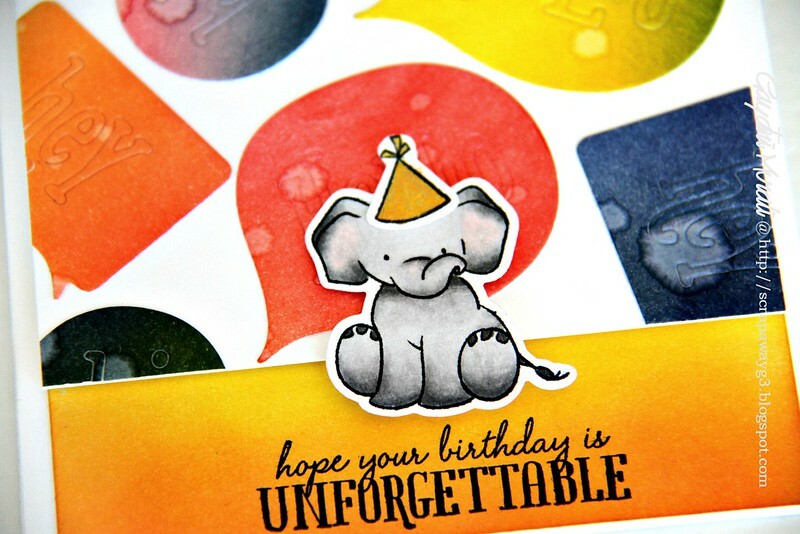 I stamped the sentiment from the Unforgettable stamp set using black ink. I stamped, coloured and die cut the elephant from the Unforgettable stamp set and adhered in the middle using foam adhesives. To make this card, I used Wplus9 sketch #3 from Getting Sketchy challenge. Great way to use the dies to create your background! Fabulous! Holy CUTE, Batman! The inking is amazing and that background is just pure genius! I love this! What a fun design, Gayatri – love the happy colors! AWE this is really cute!!! I really love the bright & fun colors as well as the background! !Absolutely adorable! too cute Gayatri. really pretty card. Love the background, so pretty!